With the Show Circuit behind us we were looking to the major events slowing down somewhat but that certainly did not occur, and our people continued to support many events throughout the month. The Darwin Cup weekend was a very busy time for us all and further events such as the Garma Festival (Story in this edition) was a busy event to cover but very educational for our people who attended. With many high ranking Politicians and indigenous leaders in attendance we were kept on our toes and assisted where required. On the 16th of the month we held our annual Paramedic of the Year Awards which was again supported by the Darwin Sunrise Rotary Club and held at Parliament House hosted by Health Minister Natasha Fyles. It was a most memorable night with a record number of nominations with overall winner Caitlin Little’s speech being reflective of why her nomination was successful. Matthew Eastham as a qualified IC Paramedic, and in his role as acting Director Ambulance Services introduced the event and spoke with passion on the roles our people play and the support our partners provide in assisting us to perform our roles. It was a great evening and full details are in this month’s edition. In Tennant Creek last year three of our Paramedics attended an horrific job and were in support of fellow Emergency Services Officers at the scene which with a co-ordinated approach went very well. The Police Commissioner recently acknowledged the work involved from all those in attendance and our people Katie McLeod, Nicole Foster and Robyn Orchid each received a NT Police Commissioners Letter of Recognition. Well done to everyone involved. Towards the end of the month we held a launch and subsequent media event for our newly designed Emergency response vehicles, a self-loading electronic stretcher and state of the art designed response and vehicles kits. This was a great day with the Minister for Health, Natasha Fyles officially launching all the new products and all forms of media were in attendance with suppliers of the major components also in attendance. The commentary around these upgrades was that the NT now is the leader in the field for a number of these products and concept designs for both Emergency response vehicles and equipment. The staff survey results follow-up discussions with our people has resulted in some 10 sessions being conducted across all areas of St John NT and the feedback and clarification on some of the responses has been fantastic. This feedback has allowed the Executive team to determine the areas of priority and we are now in discussions with “Voice” (the survey co-ordinators) to progress to the next stage. This will be an ongoing process and will be supported by a further survey at the one year anniversary of this current survey. I would like to express my gratitude to all that have attended these sessions and it has been very positive for me to hear first-hand how we are travelling and the encouragement that change is occurring is most satisfying and reflective of our forward thinking approach on how we develop into the leader in our fields of endeavours. We are proud to announce the 2017 Paramedic of the Year as Caitlin Little of Alice Springs. In keeping with the strong community support of previous years, we received a total of 40 nominations for Paramedics, Patient Transport Officers & Communications Officers across the NT for these awards. The calibre of these nominations was extremely high and these nominations have been received from members of the public attended to by our people, as well as from those who have witnessed and been comforted by their work. Nominations were also received from colleagues who have nominated their peers and new practitioners, those with less than 3 years’ experience. Caitlin Little is originally from Gippsland in Victoria. She completed a double degree of Bachelor of Paramedicine and Nursing through the Australian Catholic University. She began her career in Paramedicine through Victorian Ambulance where she completed her graduate training and became a qualified Paramedic. Wanting to pursue her passion in remote medicine, Caitlin gained a position with St John Ambulance NT in 2014 moving to Alice Springs. 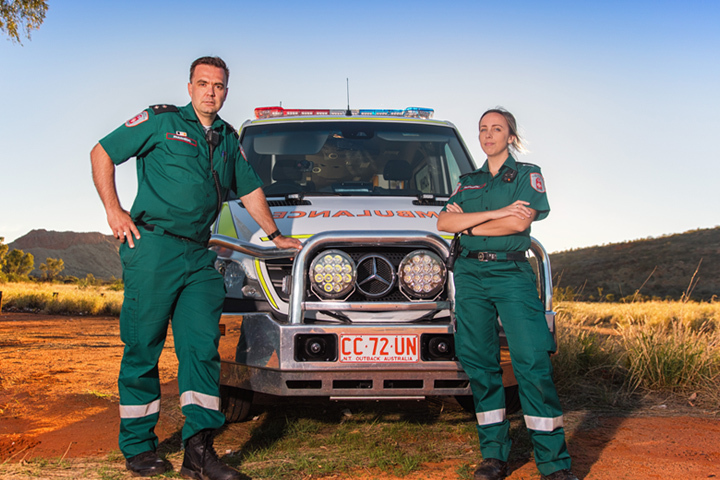 During her time in Alice Springs Caitlin has quickly proven herself to be an outstanding Paramedic and team member. Caitlin is a dedicated contributor to the organisation having completed numerous roles in addition to her qualified Paramedic role including; Mentor to new Graduates, Acting Station Officer, Peer Support Officer and Health and Safety Representative. Caitlin continues to exemplify qualities and attributes of a St John NT Ambulance Paramedic. She is dedicated both professionally and in a volunteer capacity to providing the best quality prehospital care for the sick and injured within the community. Caitlin continues to work casually as a Registered Nurse at the Alice Springs Hospital as a team member in the Emergency Department, and recently travelled to Nepal in a volunteer capacity with the Wild Medic Project assisting in primary care health delivery to remote Nepalese communities. Caitlin is furthering her studies as she is currently studying a Masters of Advanced Paramedicine through the University of Tasmania. Highly regarded amongst her peers, managers, allied health professionals and most importantly her patients. Caitlin has established herself within the organisation and community as a dedicated, compassionate and respected St John NT Ambulance Paramedic. Caitlin is a well deserving recipient of the 2017 Paramedic of the Year award. St John Ambulance NT and the Rotary Club of Darwin Sunrise congratulates all nominees and we would like to take the opportunity to thank the Department of Health, Minister Natasha Fyles and Professor Catherine Stoddart for hosting the Paramedic of the Year Awards, and also thank the long term sponsors of the Awards – Northern Territory Government, United Voice, Territory Surgical Supplies, Mercure – Darwin Airport Resort, Telstra Shop Palmerston and Country Classics. On the 29th August 2017, St John Ambulance Australia NT launched a fleet of five (5) new Ambulances with a short ceremony at the Casuarina Ambulance Station. Matthew Eastham, Director of Ambulances Services said “this is a very exciting time for the organisation and represents a significant step forward on many fronts relating to quality, safety and providing our people with a contemporary work platform. There are also many benefits for our patients. To put this into perspective and in relation to technology our vehicles will have some of the newest equipment and latest technology available”. Each of the 5 Mercedes Benz Sprinters underwent a significant modification process, at the St John Ambulance Workshop. Here they were fitted with the latest equipment including integrated touch screen technology, dual stretcher capabilities, seating positions and improved equipment access and storage. Each Ambulance is fitted with Ferno Solbian solar panels which supply a constant charge to vehicle batteries and equipment, reducing the need for on board 240V shore-power. The most exciting introduction to the ambulances is Ferno’s cutting edge no lift to load, powered stretcher, the Ferno iN/X, with a lift load of up to 318kg. A special feature of these stretchers is the integrated lighting system on the side rails which allows paramedics to see and be seen in dark and in hazardous conditions. St John Ambulance has worked closely with Ferno for technical assistance, service and product training ensuring the new ambulance fleet is current and remains future proofed to provide better paramedic and patient safety and also enhance the paramedic work environment. Long lasting, ergonomically designed NEANN paramedic kits have been supplied by RAPP which uses revolutionary developed material EnvironFrei with a coated internal fabric to minimise cross contamination risks when kits are in use. These kits were recently displayed at the Council of Ambulance Authorities conference held in Adelaide, as cutting edge paramedic kits purpose made for our NT Ambulances. On road the Ambulances will have higher visibility to motorists with the addition of extra reflective stickering and even the most distract of motorists will hear and see the Ambulances coming with the addition of the new Banshee sirens. These sirens are the only ones currently available on the market to have a dual tone capability, low frequency alert tone and air horn. The low frequency tones help to gain the attention of the most distracted driver and those drivers in modern, highly insulated vehicles. AMTEK, a company who specialises in special vehicle builds in Australia have been instrumental with assisting St John Ambulance in the design process of these new fleet. Where ever possible St John Ambulance sourced a range of local input, from powder coating, window tinting, auto electrical services and even the internal upholstery of the equipment pockets. Steel fabrication of the internal “grab racks” which hold the paramedic first aid kits where custom designed and refined to fit the new fleet by Metalmaster Fabrication. Many of these key features are a first for the Ambulance industry in Australia and represent the future of Ambulance services for St John Ambulance NT. After the ceremony invited guests were given the opportunity to take a closer look at the new ambulances. In a small ceremony in Tennant Creek this month, 3 of our St John Ambulance Paramedics, Katie McLeod, Nicole Foster and Robyn Orchard, each received a special "Commissioners Letter of Recognition" from Commissioner of NT Police, Reece P Kershaw APM. In the letters Commissioner Kershaw stated the reasons our ladies received this special recognition and made special mention of their “outstanding decision making and exemplary actions in an immensely stressful and dangerous situation”, which they attended to with NT Police in Tennant Creek last year. This is considered to be great recognition for our paramedics by another emergency service operator and again shows the professionalism and confidence of our St John Ambulance Paramedics has again shone through. The 19th annual Garma Festival, a celebration of indigenous culture, was held at the Gulkula Ceremonial Grounds in North East Arnhem Land this month. Garma, coordinated and programed by the Yothu Yindi Foundation attracts an exclusive gathering of 2,500 people and also brings together business leaders, international political leaders, intellectuals, academics and journalists to discuss the most pressing issues facing Australia. Garma incorporates visual art, ancient storytelling, dance and music, as well as other important forums and education and training programs relevant to cultural tourism, craft, governance and youth leadership. St John Ambulance paramedics and volunteers attended the festival to provide first aid coverage of the event. Feedback from the organisers and public was very positive for St John Ambulance and recognised the outstanding professionalism displayed by the crew at GARMA and the crews transporting people from the site. Rhys Gloury who was the Acting Officer in Charge at Nhulunbuy mentioned that some staff had “personally been invited back next year and this in itself is a sign that the St John Ambulance presence at the event was highly regarded and this is something we all can be very proud of. Overall we transported 5 patients to Gove Hospital, however the crews at GARMA treated many others”. Crews attended a debriefing on the Monday after the festival where they were thanked for all of their work and volunteering hours over the Garma weekend. Pictured are Rhys Gloury and Belinda Stagoll with Australian Prime Minister Mr Malcolm Turnbull who participated in many open political discussions at the festival. The Skills, Employment and Careers Expo took place in all areas across the Northern Territory this month with St John Ambulance represented over the entire circuit in Alice Springs, Tennant Creek, Katherine, Darwin and Nhulunbuy. More than 5000 interested job seekers, career changers, students and those interested in upskilling passed through the expo doors seeking information from industry operators. The Darwin expo provided plenty of opportunity for hundreds of students to “have a go” at saving a life with numerous CPR demonstrations offered by St John Ambulance Medical Director, Mr Malcolm Johnston-Leek. Clinical Staff gave some great lifesaving demonstrations and diligently answered questions from enthusiastic onlookers. Students were given a firsthand look inside one of our new fleet of high-tech Ambulances which was on display at the expo, with much interest around Ferno INX powered stretcher. Employment opportunities with St John Ambulance are vast and we are one of the largest employment providers in the Northern Territory. In 2016 St John Ambulance employed 274 staff and had a registered volunteer base of 555 members. Our large skills pool enables St John Ambulance to provide emergency first aid coverage, not only in the city streets but also in the remotest of outback locations. Attending expos such as this allows us to recruit job seekers, build on our brand and demonstrate our services to wide audience of people.